After launching OnLive Desktop for iPad users last week, cloud gaming service OnLive released on Thursday its free Windows desktop virtualization app for Android tablets. 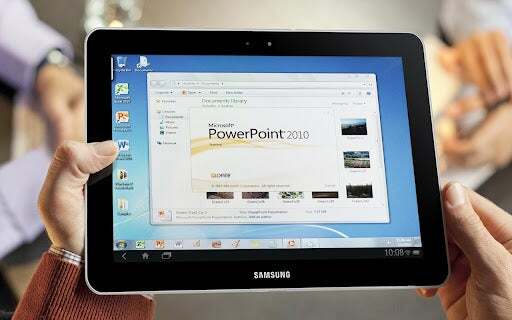 Now Android users can run Microsoft Office apps and even stream videos and games to the tablet. OnLive runs Windows on its own servers, where you can also save your files. While the app is free, various subscription plans range up to enterprise level. The free, Standard service provides 2GB of cloud storage so you can transfer files between OnLive Desktop on the tablet and other devices. It provides access to Microsoft Word, Excel, PowerPoint, and Adobe Reader on the tablet. Several other standard Windows desktop applications that come preinstalled in the free version include: Notepad, Wordpad, Windows Journal, and Windows Media Player, according to Android Police. OnLive Desktop includes Microsoft Office Word, Excel, and PowerPoint apps. Upgrading to OnLive Desktop Plus for $4.99 a month adds IE 9 web browsing with Flash, Dropbox integration, priority support, and webmail attachment support (such as for accessing Gmail and Yahoo attachments). Also in the works are other subscription plans: A Pro version starting at $9.99 a month will increase the cloud storage to 50GB instead of 2GB, plus an Enterprise version for IT-managed desktops, pricing yet to be announced. The app is available on the Android Market now for tablets running Android 2.3 and above. It has been tested to work with tablets such the Motorola Xoom, Samsung Galaxy Tab, Acer Iconia Tab A500, and ASUS Eee TF101. Once downloaded, sign up for your plan at OnLive's website. OnLive Desktop, which runs on its own servers, also works with most Bluetooth keyboards and mice (though left-click only). This might lead Android tablet users to consider ditching their laptops altogether now that they can take along a virtual Windows 7 desktop--in a much smaller package--wherever they go.